The story of teenaged Kamran Khan, who belonged to a poor family and is now playing for the Rajasthan Royals cricket team in the second season of IPL, is more important as it brings cheer to a place that had earned notoriety lately. 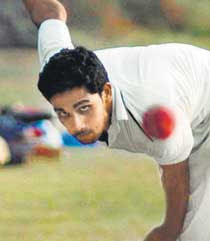 Khan, a speedster, hails from Azamgarh in Uttar Pradesh. It has been a long time since a good story emerged from the place, which unfortunately got linked to mafia (Abu Salem) and later for terror links. Such was the situation that youths (both Hindu and Muslim) hailing from any City or town in the Azamgarh district that has a population of 4 million, found it almost impossible to get jobs or houses on rent. They had to conceal their identities, just because of the misdeeds of a few and a hysteria created by certain news channels about the place termed 'Aatankgarh'. Khan manages to bowl as fast as 140 kmph and has been getting wickets in his first four matches, even playing an important the team's wins. He hasn't played a first class match till date but has managed to secure a contract of Rs 12 lakh and is now playing in Indian Premier League in South Africa. He hails from Nadwa Sarai village. After his father's death, Kamran's mother rolled 'bidis' to eke out a living and run the household. The left-arm seamer earlier used to play tennis ball cricket but has taken to T20 rather effortlessly. Just recently a guy asked my reaction on a Muslim girl becoming the top ranked player in women's tennis. Dinara Safina, a Tatar, is the number 1 player in WTA rankings. Earlier her brother Marat Safin had also been the highest ranked player in men's category for a short while. Though excelling in competitive tennis that is played in almost 200 countries is an altogether different achievement, the fact remains that accomplishments in fields like sports go a long way towards changing perception about communities. Indians have never never had any dearth of sporting heroes. We have them belonging to all communities. Though it's just the beginning of a career for the young lad, poet Kaifi Azami's birthplace has got a hero, which it needed so desperately in these times. Azamgarh needs more such youths may excel in education, sports, social work or any other spehere of life. Of course dedication is needed. But Azamgarh has produced men of learning and erudition in the past. It needs to reclaim that past glory. From April 13 till April 22, India witnessed repeated attacks on trains, killings of security forces in large numbers spread over six states and that involved at least five different terrorist groups, but nobody termed it terrorism. None of these attacks including the daredevil strike on NALCO plant in which 11 security personnel were killed, was shown on TV. Footage was rare and not repeated. There was no talk about modules, identity of those involved and that how they get the weapons. Believe me, had any of these attacks involved a Muslim, it would have been termed a Terrorist attack and for days, we would have been shown images of 'trained Muslim youths', their links, cell phone records, the masterminds, the names of obscure organisations with Arabic names and what not. Read the newspapers reports and you will find that the word terrorism was never used. Even the word militants was not used. Just like LTTE remains Tigers or Tamil rebels, the Naxals were called Maoists or left-wing extremists and the Assam groups termed as ULFA separatists or outlawed factions. How many of us have heard the name of Black Widow group that killed seven persons North Cachar district? Headlines read, 'Cops killed in fresh violence in Assam'. The news items are put in inside pages and the word terrorism is nowhere to be found. Assam is far away. It may be said that the death of Inspector MC Sharma gets coverage because, it happened in Delhi and the six or eleven who die, don't get a mention anywhere because it happens in rural areas. The same Assam has witnessed serial bomb blasts thrice in four months but this was ignored. However, once when it was believed that a Muslim-sounding group was involved, it had suddenly forced anchors in Delhi to sit up and call retired guests from intelligence agencies to discuss it with all seriousness for at least an hour. Neither photographs of suspects were flashed nor there were followup reports on television channels. It's not my persecution complex. Hold your hand on your heart and tell me, why the above mentioned incidents don't fall in the category of terrorism. Any Indian Muslim would feel bitter about this media myopia. One incident involving a Muslim's arrest on mere suspicion, leads to a frenzy across the country and he is not termed suspect or accused, but directly called terrorist without having the case even reach the court. Tell a lie a few times and it becomes truth. Repeat it every day and the most sensible guys begin to believe it universally. Even Muslims are often feeling what's wrong with them. Hysteria is created everytime on TV when a Muslim is caught and the other incidents fail to find mention, or don't have any TRP? This is something very fishy. I hate conspiracy theories but tell me why there is such a serious distinction. It seems more than United States of America, it is we who have been blinded by the so-called War on Terrorism that was launched to further America's interests. All forms of terror has to be condemned and treated equally. More than politicians, bureaucrats and media, it is the Muslim community that itself is to be blamed. They have failed to raise the issue rationally and logically. They are hurt and angry but they don't protest properly, by approaching the news channels and take legal ways to fight this malaise, which is causing a deep crisis for Indian Muslims and the image of Islam. This sort of defamation is truly discriminatory and is hurting everybody. The bombardment of news from persons with either biased minds or skewed vision, is causing a serious damage to all of us. AK 47 and other assault rifles were recovered from them also but this doesn't find mention. When Naxalites tie huge explosives on their belt or fire at a DGP's chopper, it should be no less an explosive story, as other incidents. Unfortunately it's not the case. I have long back stopped arguing why terms like 'Muslim terrorism' are used. I am told by bumpkins that because the militants claim that they are following Islam. So does every criminal who claims that he did the right thing. Entire Muslim clergy in India has termed them as terrorists and issued fatwas against them. Even Naxals have an ideology and claim that they are doing justice. Anyway. I simply want to say that if you call a suspect, terrorist, just because he is a Muslim, you should also call a terrorist who has gunned down many, a terrorist. By calling him a rebel, you are turning him into a hero. I think we really ought to have a national debate on terrorism. Read over a dozen earlier posts on this blog on Terrorism. The great guerilla warrior and freedom fighter Commander Tatya Tope was executed exactly 150 years ago. The anniversary of his death passed without any notable event or mention to this legendary figure of the War against imperialist forces. It was on April 18, 1859 that this great figure who had traversed across Central and North India, fighting the British forces and uniting the rebel sepoys, died. He was sent to gallows by a Kangaroo court soon after he was arrested. Tatya Tope was hanged to death in Shivpuri in Madhya Pradesh when he was just 45. Along with Nana Sahib, Azimullah Khan, Ahmadullah Shah, Kunwar Singh, General Bakht Khan, Azizan, Begun Hazrat Mahal and other heroes, he is among the tallest figures of grand Indian struggle to the Company rule. After the spark of Meerut spread across the country, the soldiers of East India Company had joined the revolution and Tatya had become the Commander-in-Chief of the fores. He had witnessed the entire war [termed as mutiny by British], wrested Kanpur and Kalpi, reached Jhansi where their [and Rani Laxmi Bai] joint armies had defeated British forces to proclaim independence. Though the British re-captured it later, Tatya kept organising bands of fighters, criss-crossed the entire Bundelkhand, Central India and United Provinces from Bharatpur (in present day Rajasthan) to Bithur and beyond. From Gwalior to Jora Alipore, crossing Chambal river, reaching Tonk and later Bundi, then passing Bhhilwara, Kankroli and Jahlrapatan to reah Rajgarh, Biaora, Sironj, Chanderi, Isagarh, Khurai, Bagrod, Rajpur, then crossing Narmada and through Banswara, reaching Zirapur, Indargarh, Sikar and dozens of other towns. Quite similar to Tipu Sultan, this brave warriour also ran out of luck. It is believed that his own trusted friend Man Singh of Narwar had betrayed him. Man Singh was promised that if he helped the EIC, he would get his territory back as reward for this service. The rare pictures and portraits of the era including the photographs of the armies of Tatya Tope and Nana Sahib make an impressive sight. They look smart, well-armed sepoys ready to take on the might of the empire. They were mostly the East India Company soldiers who had joined him. Tatya Tope spent long time in jungles. The Bitish generals were scared of his guerilla tactics. For a long time he dodged them and had skirmishes with forces. But after the betrayal, he was caught on April 7 and brought before the court. During the trial, he said that it was his duty to fight for reclaiming his motherland. Within 11 days the Compnay executed him. He asked the hangman to stay away and himself put the noose around his neck. Though there were later speculations that someone else was hanged and Tatya had managed to escape. However, it seems to be the optimism among the masses whose spirits had hit an all time low after the failure of the revolution, and wanted to believe that he was still alive and planning for a great battle. 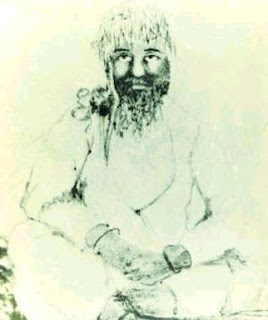 Tatya Tope, whose real name was Ram Chandra Pandurung Yolekar, was born in 1814. His father had accompanied Peshwa Baji Rao from Pune to Bithur. Young Tatya was just a few inches over 5 feet but his valour made him one of the heroes of the war of 1857. He was feared among British forces. Tatya had led the assault on General Havelock's army and defeated it near Ganges. He had battled the armies of Campbell, Major Rock, Homes, Roberts and kept playing hide and seek with British forces even when the Company forces had re-captured most of the areas in other parts of the country. I couldn't find a single report on Tatya Tope on any of the channels on the 150th anniversary of his martyrdom. Isn't it a shame? Twenty20 cricket, Elections and the Celebrity culture seems to have eclipsed every other thing. Remaining slots were occupied by the daily reports about Taliban. Though a couple of years back there were a couple of reports about the plight of his descendants living in Bithur (Kanpur) and Railway Minister Lalu Yadav had given job with the railways to a family member. However, it is sad to see that society remains almost apathetic and the newspapers rarely remind us of such occasions. It's not so unusual as the 150th anniversary of Ghadar had also passed two years back with barely a few seminars and functions to speak of. Lok Sabha elections 2009: Will Opinion polls prove right? Opinion polls have failed quite often but that doesn't deter TV channels from conducting their own pre-election surveys which claim to represent the voters' mood. In a month, the composition of the Lok Sabha will be clear and I am looking forward to see if any of these polls would be close to the actual mandate given by the Indian electorate. No doubt the opinion polls interest the audience but once again we will see how much the pollsters know the pulse of Indian citizen. Almost all the channels have given a clear edge to the Congress-led UPA. NDA has been trailing in opinion polls except the one, conducted by India TV. The most recent analysis of NDTV*, shows that UPA is going to get 210 seats [231, if Samajwadi Party supports it after election], followed by NDA 166. The third and fourth front will be in the position to make or break the next government. I really don't see how Congress is getting 163 seats, as the table above shows. After all, which states are they going to get so many seats from? Isn't it too much in favour of Congress? BJP gets 123, JDU 22, Shiv Sena 9, AGP 4, Akali 3, RLD 3,INLD 1 and NPF 1. Total 543. Needed 272 for majority. Two MPs are nominated. It seems so easy here for UPA. If either Left or BSP comes to rescue, the UPA will reach the magic figure. But is it going to be so easy? I don't think so. Star News-AC Nielson forecast had given UPA 257 and NDA 184 seats. CNN-IBN and CSDS poll gave margins: UPA 215-235 and NDA 165-185. Some other channels including Total TV said that it will be a UPA whitewash and BJP would be nowhere. India TV however predicts that NDA will emerge as the biggest alliance with 189 seats and UPA will be a close second with 185. With the first phase of poll already behind us, it's a matter of weeks that the likes of Prannoy Roy, Dorab Supariwala, Yogendra Yadav and other psephologists would sit and tells us how close to the results, they were in their opinion polls. Nobody seems sure of what is happening in Uttar Pradesh. The state that has a population of 180 million (180 crore) will hold the key. Through out the 90s, BJP remained a favourite for psephologists and they wrote off SP every time. However, Mulayam Singh Yadav emerged stronger with every elections. Now after Mayawati's victory in the Assembly polls, BSP seems the most intriguing party to everyone. Pollsters are even predicting 40 seats out of 80 to BSP. This is despite the fact that Brahmins are not going to vote for BSP with the same passion which they did in the Assembly polls when the issue was a change in the state government. Many see a revival of BJP. However, a Varun Gandhi episode can't change the caste-based UP politics overnight. BSP had a tally of 19 seats in the last Parliament. It may go up to 24 or 26 but I find it unbelievable that their vote percent would shoot up as much that Mayawati would be able to bag half of the seats of the state. In fact, these days everybody seems to love calling Mayawati an enigma. She is already being touted a Queen. I have nothing against her but I feel, most of the journalists are in awe of her as she doesn't allow anybody to get close to her. NDTV gives BSP 42 seats. Is it plausible? Of course, SP may lose some vote but it will hold its turf. Either it's Lok Sabha election 2004 or the Vidhan Sabha elections of 2002 and 2007, SP has maintained its vote share at 26%. No other party has managed to do that (except Congress at a mere 8.8%). BSP had in the meantime increased its share considerably (by +7%) while BJP lost as much (-7%). In 2004, SP had won an astonishing 37 seats followed by BSP that had 19 seats, BJP could win 10 and Congress 9. RLD had got 3 while two Independents had entered Parliament from UP. Now let's wait for May 16, and see correct these psephologists have been about Election 2009. Apart from UP, I am in interested in the performance of Left in West Bengal and whether the alliance of Lalu Yadav-Ram Vilas Paswan will stop the Nitish Kumar's JD (U)-BJP juggernaut in Bihar. Both have solid and transferable vote banks but if opinion polls give them just 10 seats, I wonder at the sample size of the electorate that was taken in consideration. In one of the first polls, two decades back Congress was given a majority though it was VP Singh's National Front that ultimately formed government with BJP's support. Over the years, we have seen polls go horribly wrong. In Tamil Nadu polls had missed the clear strong electoral wave. So I am eagerly awaiting the election results to see the veracity of these polls. Howsoever, smartly these results may have been presented, it's tough to come out with figures that can be justified in case either of the fronts emerges clear leader. Why it's tough to predict in India? We don't have a US like system. Neither do we have a two-party system. Often electorate doesn't know the (regional) party he has voted for, would end up supporting Manmohan Singh or LK Advani or neither. TDP, AIADMK, BJD, RLD and many others can go anywhere. In multi-cornered [three and four cornered] fights, as in most UP seats, mathematics can't work. So it's not statistics alone that can lead us close to the real picture. Especially, when the people hide their support. Muslims, Backwards and Dalits often publicly name Congress or BJP as the party of their choice in UP but end up voting for BSP or SP. So, the credibility of the polls is at a real test in this election. Waiting for May 16. And if they go wrong will the psephologists, accept it and say sorry! BJP, Congress equally worried about numbers: Who will form government UPA or NDA? Will UP Muslims vote for Samajwadi Party? Come summer and cane juice stalls are seen at every nook and corner in most cities across the country. Coming home I heard a woman from the basti near my house yell at other women, 'Maulana ki dukan tak ja rahi hun' (I am going to Maulana's shop. That's the Ganne ke Ras [Cane juice] shop. The shop's name was interesting--Sai Baba. The person managing the shop had a skullcap on and was wearing the kurta pyjama. Maulana Sahab appears quite liberal, I thought. Though it's not unusual. Just like there are Hindus and Sikhs going to tombs, graves and dargahs, many Muslims do revere Hindu saints as well. A couple of days later I was again passing by the shop and had a look from the other angle. The photo of Sai Baba's idol in Shirdi was placed by the side of the machine. Now I was getting more interested. On an off day, I stopped at the thela and asked the guy. Raja ji told me that it was Maulana's shop and he was a partner with Maulana. "That's no issue. I told him that I would like to have a photograph of Saibaba and brought it here." "It works. The sale is up and we will earn much more than previous years. ", says Raja. They were too busy and after a while I finished my glass and left. This is not the first time I have seen such a shop. In auto-rickshaws [and buses] one often finds 'Jai Mata Di' and an Islamic calligraphic side by side. Often the owner belongs to one community and the driver belongs to the other community. But neither has any problem with the belief of other person. Amid the electoral din and endless debates over communalism and secularism, it seems apt to write a post on how harmoniously ordiary Indians go about their lives. They work, they worship and they do have the real wisdom [more than the comparitively highly educated who are often less tolerant] which is the strength of our multi-cultural and multi-ethnic society. Whither West Bengal: Is Communist Citadel Crumbling? 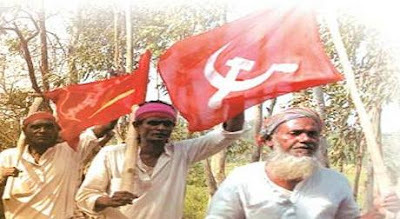 West Bengal has been an impregnable Leftist fortress for over a quarter century but there is a feeling in this election that the Communists are losing ground in the State. Though in earlier elections also, especially when Mamata Banerji formed her Mahajot, there were similar speculations. However, the difference is that even Communist leaders are feeling that there is a sense of disenchantment with the CPI (M) among section of voters. For decades the rural populace strongly voted for the Communists. They had benefited from the land reforms and Jyoti Basu enjoyed an uninterrupted reign in the State for decades. But the industrialisation efforts of Buddhadeb Bhattacharjee received a jolt with the mishandling of situation in Nandigram. The farmers feared that land, their prized possession, would be taken over. The findings of Sachar Commission were a wakeup call for Muslims. Despite repeated promises there was no development in areas dominated by Muslims and Urdu was not accorded the status of official languages in the districts where Urdu-speakers are predominant. The fact that unlike other states, West Bengal (and Assam) have more Muslims in rural areas than urban agglomerations, can cause further trouble for Communists. The strong anti-incumbency after decades of rule can be damaging. However, the Left can still tide over it. The latest Opinion Poll [Star TV-AC Nielson survey for Lok Sabha elections 2009] predict that Communists may just manage their hold in WB. It gives 22 seats of CPI-M and its allies including Forward Bloc while Trinamool and Congress will together get 20 seats. The BJP remains a non-entity in the state. Also, CPI (M) will not be as major a party as it was in the Lok Sabha. The poll says that after Congress (155) and BJP (147), the largest parties will be Samajwadi Party (28) and BSP (26). As a block, the Leftists--CPM, CPI, RSP and FB will get 35 seats from West Bengal, Tripura and Kerala. This is going to be a setback for the Marxists. But it seems that they will manage to retain the state somehow. Is it because of the reason that the West Bengal doesn't want to go with the rest? Bengal has a strong identity. It had a renaissance unlike other states and gave the nation legendary reformist personalities like Raja Ram Mohan Roy, Rabindra Nath Tagore, Ishwarchandra Vidyasagar, Swami Vivekananda, Sri Aurobindo, Subhas Chanra Bose and Kazi Nazrul Islam. And we are all too aware of the saying 'What Bengal thinks today, India thinks tomorrow'. The Bengali has a strong sense of culture and identity. The bhadraloke has refined tastes and loves to be a rebel. It is this romance with the rebellion that perhaps prompt the West Bengal voter to remain different from the rest of the country by voting for a party that doesn't have much popularity in other parts of the nation, especially Delhi. After the Congress government had sternly dealt with radical youths during the Naxalbari movement. Or it is the rejection of the mainstream parties that gives a sense of satisfaction to Bengal. Probably it is this tendency of the voter to rebuff the Congress and the BJP that may just help Communists survive another Parliamentary election. It was exactly thirty years ago that the United Liberation Front of Asom or Assam (ULFA) was founded with the aim to establish an independent sovereign state through armed 'struggle'. The foundation day was April 7, 1979. And to mark its raising day, it again struck--serial blasts across the state on the eve of Prime Minister Manmohan Singh's visit (that was cancelled) causing the death of 10 persons and injuries to 70 others. Wasn't it an open and audacious challenge to the government? But that's hardly surprising given the dreaded outfit's history. On its official homepage, the outfit claims itself to be a revolutionary political organisation that aims to liberate 78,529 sq km of land illegally under Indian occupation. The masterminds of the recent blasts were Pradeep Kalita, Akash Thapa and Mukunda Rajbongshi, police said. The deaths and destruction in North East generally goes unnoticed compared to rest of the India. In the last 30 years, nearly 8,000-10,000 persons have died in the region due to clashes between militants [or terrorists] who prefer themselves to be called as revolutionaries. The figure of deaths is perhaps second to only LTTE that is now nearing its end in Sri Lanka. ULFA rebels believe that historically Assam was never part of India. Over the years, the organisation has carried out assassinations, killed security forces' personnel and policemen apart from accusations of killing Hindi speaking labourers of UP and Bihar. Though ULFA completed 30 years of its existence, no news channel focused on doing a comprehensive story or report about 'Thirty years of Terrorism'. Over a quarter century has passed but it's either mentioned as separatist outfit or rarely as militant group in mainstream media. Is it because Assam is way off Delhi or because there is no Muslim cadre in ULFA? Kindly comment after reading the post properly. My issue is that on one hand an objectionable term 'Islamic terrorism' is used everywhere, other terrorists are not even called terrorists. ULFA, BODO, Naga, LTTE, Naxalites and Abhinav Bharat are not even called Terrorist. I don't want them to be termed as Hindu or Christian terrorist, but at least call them terrorist. But they remain OUTLAWS, MAOISTS, REBELS or at the most EXTREMISIS and MILITANTS. That's the basic issue. Is it that only a group that has Muslim cadre qualifies for the definition of Terrorist? Crores of Muslims aren't fools, as they notice this prejudice every day. Elections 2009: Muslim politicians' visits to temples, would you call it majority appeasement? Indian general elections are a colourful affair. It's not just the Hindu leaders who pay obeisance at Islamic shrines, but there are lots of Muslim politicians also who are visiting the temples. Just last week there was a furore in West Bengal when senior CPI (M) leader Mohammed Salim had visited a famous temple and sought blessings. He had sipped the 'charan-amrit' [ceremonial sacred water off the idol] that had led to major controversy and hoardings were put up in Kolkata, against a Communist leader performing puja, consuming prasad and practising the politics of appeasement [ya, you read it right]. Far away in South India, a few voices were raised but no fatwa or protest. 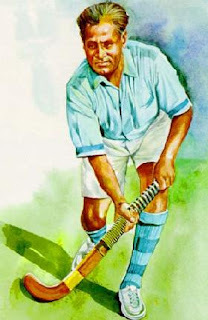 The recent incident involves a Congress leader and former hockey player Aslam Sher Khan. He is contesting on Congress ticket in a Madhya Pradesh constituency and visited a temple to seek blessings for his victory in the Lok Sabha polls. So it's not just the Maulana Mulayams who are accused of wearing the skullcap and hosting iftaars or meeting Ulema to seek votes, Muslim politicians are not much behind. There are many other leaders visiting the temples. 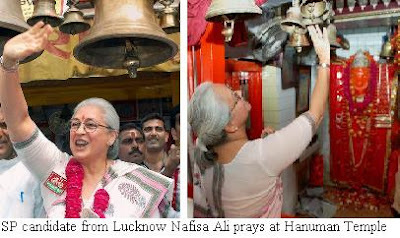 The Samajwadi Party candidate from Lucknow* Nafisa Ali visited the Hanuman temple and started her campaign after puja. She is a new entrant to SP. Of course, most of them who otherwise love to have photographers around, often regret that their picture was taken at the particular moment. With elections just 12 days from now, we will see more interesting news and mini-controversies propped up every day. Mostly it's the rival candidates or the dissidents in one's own camp who try to raise such controversies. However, the electorate seem to have become mature enough to look through the reality and that's the reason that after a flutter for a day or two, such controversies dies a natural death because voters don't react as per the 'expectations'. Such photos of Varun when he visited Pilibhit in the past, now appear shocking. But that's what politics is all about, at least, in India. 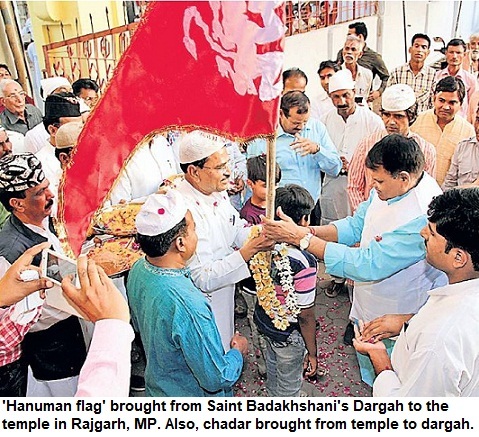 Photos: Congress candidate from Betul Aslam Sher Khan seen paying obeisance at a temple. 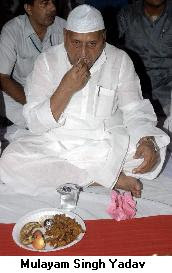 The other photo shows Mulayam Singh Yadav who keeps getting flak for being pro-Muslim and for appeasing Muslims though he has never offered Namaz as per my knowledge.